We are learning about social media content strategies this week. We’ve doubled the fun by putting one of the most powerful trends in social media – visual communications – into action in this assignment. Our task was to find images or infographics that helped us understand content strategies and to examine their strengths and weaknesses. To use an old-school term, a content strategy is similar to an editorial schedule – a plan for what you will create and deliver to your readers. Here are the three best visual aids I found for understanding content strategies. 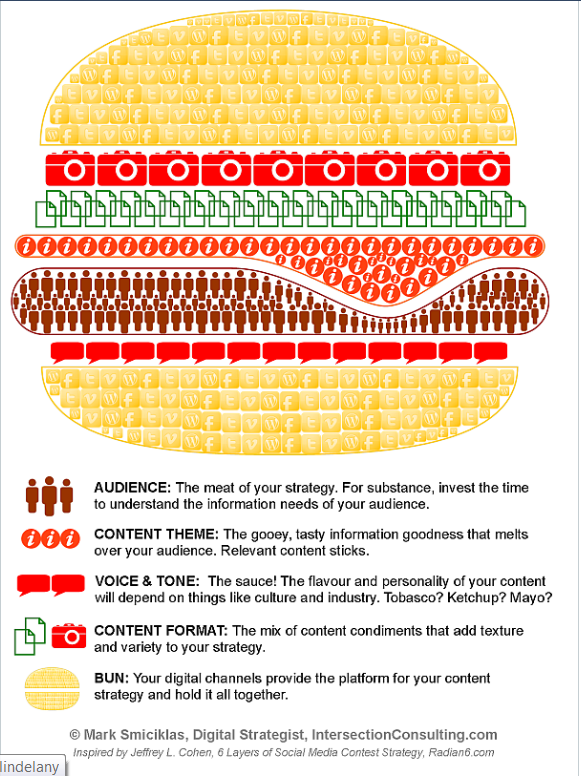 Using a burger to illustrate the elements of a content strategy is brilliant. This infographic clearly shows that the heart (or in this case, the meat) of a content strategy is the audience: who they are and what they want. This part of the meal drives everything else: message, topics and formats (words, images, video), purpose, voice, sources (i.e., created or curated) and channels. Showing information, themes and formats as yummy sauces and condiments is a great way to remember to create the stuff your audience loves. Is success on your menu? I like this image from The Mind Map Library because it reminds communicators that any good strategy starts with answering basic questions – lots of them. This graphic prompts us to consider who, what, where, why and how when creating a plan, which is as applicable to content strategies as communication planning. The dotted line from the message blurb up to the “why should anyone care” blurb rightly insists that we do the ultimate reality check when planning: We must remember that having something to say is no reason for anyone to listen. We can’t let ourselves off the hook until we have ideas for useful content that will reasonate with audiences. It’s too bad the graphic elements are not better matched to the subject matter. I don’t understand why the messenger is doubled over backwards (looks painful, doesn’t it), or why the organizing image resembles a frozen jellyfish. Poor execution distracts from otherwise good information. This graphic is fairly basic but works for linear thinkers who like logical step-by-step processes. It succeeds because it is simple, and simplicity can make a daunting task feel doable. As a visual reference, it could help keep communicators on track toward completing a content strategy. Unfortunately, it lacks a clear definition of the elements of a content strategy so can’t stand alone to help communicators get the job done. Other resources would be needed, so let’s get back to that tasty burger. Take the poll. Which graphic works for you? Last week’s poll: What is your reaction to seeing promoted tweets? Three people responded and guess what? No one said promoted tweets usually interest them. Results: 66% find them annoying or ignore them; 33% said they would read a promoted tweet before deciding to click. 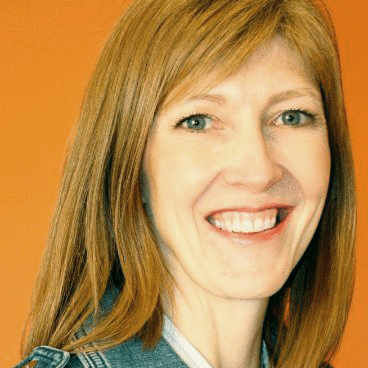 This entry was posted in Content strategy on October 4, 2012 by caroldunsmore. Hi Heideh, catchy headline for the comment. Love it. Thanks for reading…I’m heading over to your blog now. Thanks for sharing this good stuff Carol. The burger graphic works best for me too — a great example of how graphics can be an effective tool for getting a bunch of information to readers quickly. Loved the warm and engaging writing here — the doubled-over-backwards messenger in the Mind Map example puzzled me too! Hi Anne, thanks for reading and checking out the infographics. Good luck on your search for a social media course. It’s true – the burger graphic works really well. I found the Mind Map inforgraphic confusing – visually it seems to be going in too many directions. Great post! The burger is my favourite. I see that just about every blogger in class has written about it too (including me!) It is effective and the humour is great too. Let me get my vote in! I enjoyed reading your post, thanks for sharing your thoughtful perspectives. I really like the way you presented your blog topic, enticing your audience (identifying them – digital communicators) to review some great infographics that will help them (offering them a return on their invested time) with content strategy. And just love that burger!!!! Thanks Tania. Our classmates found some great stuff last week. I might do a best-of list. You found some great examples, Carol, but my favourite is still the burger graphic. It provides a lot of information in an entertaining way, and it seems many of our colleagues feel the same way! Nice post! I agree with the burger as well. I’ve never been much of a fan of mind maps. It’s interesting that in school, I’ve used burger concept to teach about the importance of a well developed idea – you can have all of the great condiments and sauces, etc, but if the meat (the idea) is rotten, it’s still going to be a rotten burger. Works for when you’re thinking about audience too.